Love hats? Then here's your chance to make your very own little hat shop! 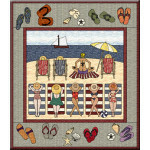 Combine piecing and applique to make this whimsical wallhanging and have fun showcasing some of your favorite fabrics while you're at it. Finished quilt size: 28"
Red Hat Lady... Stepping Out! 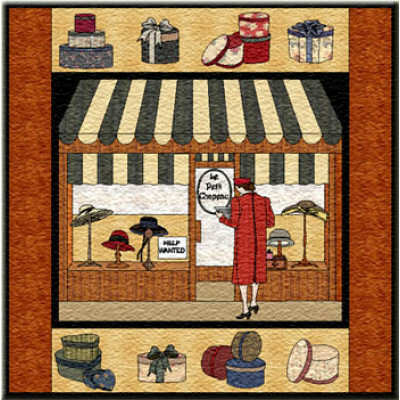 Red hat ladies are known for their bright apparel. And even though this one is prim and demure, she ..
Join in the fun with these lovely sunbathing ladies, who are anything but bashful about showing off .. 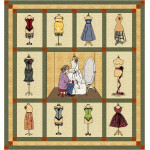 Honor your favorite seamstress with this little wallhanging depicting ten fun mannequins! This is a ..
Indulge in your love of shoes... without breaking the bank! 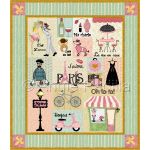 Finished size: 41" x 53 Thi..
"I love Paris in the spring time, I love Paris in the fall..." If you love Paris, too, thi..